The welcoming, nostalgic glow of candles in the window can be duplicated safely and easily with Christmas electric window candles. With different designs to choose from and models to suit any budget, every home can have candlelit windows during the holiday season. Brookstone carries electric candles that will look great in your windows. Adjustable-Height LED Candle: Pick up a candle that can adjust in height from 10 to 12 inches and also features a unique "dual-glow" bulb that will project a brighter light outside than inside. It has a timer option and costs around $13. Pacific Accents Taper Candle: The soft glow comes from just below the candle height in this tapered candle. It comes in both ivory and white and costs about $25. Cambridge Electric Light: This candle is for windows with narrow ledges that won't hold traditional window candles. The 11 1/2-inch, brass finished candle features a bracket that fits into any window and a sensor that turns the candle on in dim or dark light and off when light is detected. Each candle costs $19.99 plus shipping. A less expensive option is available without a sensor for $12.99 plus shipping. Chadd's Ford Pewter Electric Light: This 12-inch, elegant candle features a pewter base and accents. It has a no-tip feature, padded base and comes with a six-inch cord. The cost of each candle is $19.99 plus shipping. An option is also available with a sensor for $22.99 plus shipping. 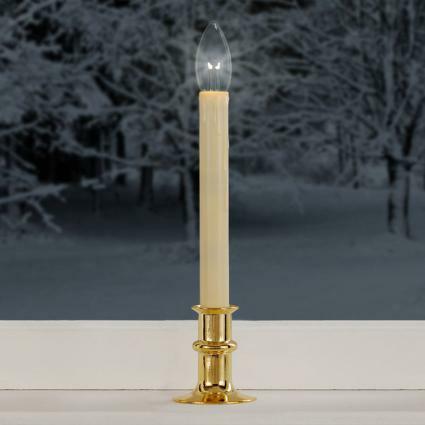 Bayside Electric Light: This classic electric window candle offers an original colonial design and has a brass finish. The candle stands 12 inches and costs $17.99 plus shipping. A version that includes a sensor is available for $20.99 plus shipping. Country Candolier: If you enjoy country decorations at Christmastime, this candle will likely appeal to you. It features a realistic-looking, flickering silicone bulb and sits on a dark forest green base. 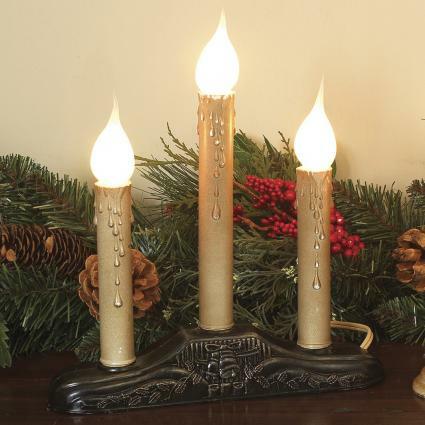 The candle stands eight inches tall and costs $6.95 plus shipping. Electric Candle with Black Stem: If decorating outside of the box is part of your holiday tradition, consider this lovely candle. It stands twelve inches tall and has a silver base and black stem. The candle can stand alone in a deep windowsill during the holidays, and you can add a lampshade and move it to a table for display throughout the rest of the year. The candle costs $9.95 plus shipping. Square Base Candle: You may prefer a square candle base to a traditional round one. This version is seven inches tall and has a two-and-a-half inch, gold plated square base. Each candle also features a handy on/off switch. The cost is $7.95 plus shipping. Electric candles have many benefits. With no melting wax, they are cleaner than traditional candles. They do not need to be replaced as the candles burn down. They produce less heat than open flames (LED candles produce hardly any heat) and are safer to use around children and pets. Electric candles can also be easily placed in areas where regular candles may be more hazardous, such as near curtains, plants, or other flammable materials. Their electrically-powered flame is also immune to casual breezes that can easily snuff out traditional candles on a drafty winter night. Christmas electric window candles are beautiful additions to any holiday décor. The gentle flicker of a candle in the window is a welcoming sight to guests and family members as they arrive at your home.